I was actually really looking forward to seeing Blood Father. I hadn't heard of it before a week ago. I never saw a trailer. I just heard from my friend that he saw it and really liked it. Plus it got really good reviews. So I made sure I took time out of my day to go and see it. My theater was empty except for one other person, and it just made it a better experience. Even though I was really excited for the movie, I knew practically nothing about it. I didn't know the plot. I didn't know really anything about it. And I find the less I know about a movie going into the screening, the more rich the experience is. Ultimately, I really enjoyed Blood Father. It works as a great callback to the old fashioned R-rated action flick, but with a lot more depth and emotion to it. Link (Mel Gibson) is on parole and works as a tattoo artist. He lives a pretty sh*tty life, when he gets a call from his estranged daughter, Lydia (Erin Moriarty), that she is in trouble and needs his help. Link has to drop everything and help her escape the mob chasing her. This film is essentially Gibson's Taken. It has a very similar plot, but I think this is a superior film. While Taken probably has better action, it's a pretty shallow film in terms of an emotional core or character development. Blood Father works first as a drama rather than an action movie. At the center of the film is a broken man trying to fix his life, and trying to reconnect with his daughter whom he has hurt through his own poor decisions. And that maintains as the film's core throughout the action beats. Director Jean-Francois Richet does a great job pacing the movie, allowing for enough character development in the beginning of the movie so that you can become attached to these characters. While the movie is a drama first, that doesn't mean there isn't action. The action weaves in and out of the story, and is brutal when it pops up on screen. The R-rated nature of the movie really echoes the classic 80's films like Predator or Rambo, that just embraced the blood and swearing. And in a modern age where we mostly get PG-13 action films, it was refreshing to see this type of movie resurface. But as I said, the action wasn't overly prevalent. It was used enough that this film qualifies as an action film, but it's not action dependent. It's instead emotionally dependent, with great character wiring and development, which makes the action mean more in the end. The acting is also excellent. Gibson turns in a fantastic, grizzled performance. He is rough and tough, but he also has a heart, and he plays the role well. Moriarty was also really good as his daughter. I haven't seen her in anything else, but I'm definitely going to keep my eye out for her now. William H. Macy has a very minor but important role, and does a good job with it. And Diego Luna was great as the villain. He was the least developed, but he still served his purpose in the movie. My only real weaknesses of the film were that it dragged at certain points. The second act wasn't as strong as the other two, but it was still fairly solid. And there could have been more action scenes. It didn't necessarily need more, but it would have been nice to have one more in there. The main reason for the mob being after Lydia also could have been stronger, especially after a revelation that comes later in the film. But other than that I didn't have really any problems with this movie. Overall, Blood Father is a very fun and entertaining film. It throws back to the hard R 80's action films, but it focuses more on its characters and drama than its action. The film is very well-written, and it is well directed by Jean-Francois Richet. Other than perhaps the second act, it's well paced. The cast delivers on great performances all around, especially from Mel Gibson. The action in the film is really good, but the movie could have used one more big action scene in it. The main reason for all the events going into motion could have been stronger as well. 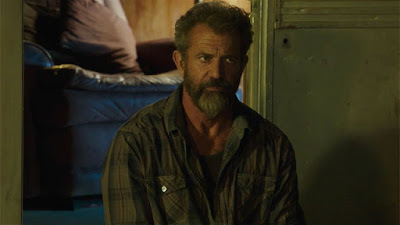 But, in the end, Blood Father delivers on being a great action film, as well as just a great movie altogether. It will strike very well with a certain group of people, and I just happened to be in that group. What do you think? Have you seen Blood Father? Did you like it? Leave your (spoiler-free) thoughts in the comments section below.